Tyler Young developed the idea for the Sobriety is Traditional learning circle through his own journey to sobriety. Tyler Uppaaruluk Young; Tsimshian, Eagle Clan from Metlakatla and Sugpiaq (Alutiiq) from Port Graham; grew up in Anchorage and spent time in Juneau as a young adult. 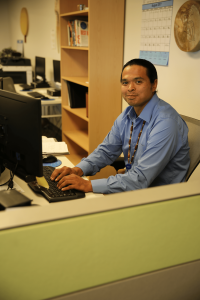 As a former Southcentral Foundation Native Men’s Wellness Program wellness intern, Young found inspiration to create the Sobriety is Traditional recovery support learning circle through his own journey to sobriety. Young was accepted into NMWP in September 2016 and was assigned to the SCF Family Wellness Warriors Initiative for his internship. While interning for FWWI, he became familiar with the inner workings of learning circles and also had the opportunity to participate in a week-long Beauty for Ashes retreat. The experiences Young gained while participating, preparing, co-facilitating, and interacting with participants in these settings left him with a profound appreciation for the potential to positively impact people. The timing of Young’s NMWP internship at SCF coincided with his journey to achieve and maintain sobriety. While working toward his sober lifestyle, he was asked to sit on the Recovery Services Alumni Council at Cook Inlet Tribal Council. RSAC was looking for ways to support others during their recovery. When the question was asked, Young had a light bulb moment and proposed forming a sobriety group that culturally embraced Alaska Native and American Indian perspectives. He liked SCF’s learning circle design and asked permission from SCF to format a sobriety group at CITC that was patterned after SCF’s learning circles. With permission granted, RSAC supported Young’s efforts. The first Sobriety is Traditional learning circle was held at CITC on Feb. 2 and has been well attended. Young currently works full-time at NMWP and continues to lead the learning circle at CITC. In August, he began co-facilitating the same learning circle at SCF with Elaine Vroman, who is a NMWP wellness associate. “Facilitating the Sobriety is Traditional recovery support learning circle is one way I am able to give back to others. Hope and recovery was given to me when I was working toward sobriety, and giving back is a part of my personal recovery,” Young commented.